It feels like most of the time we see giant spiders in the wild, they’re in caves. Certainly when they’re the focus of the plot, they’re in or approaching population centers. 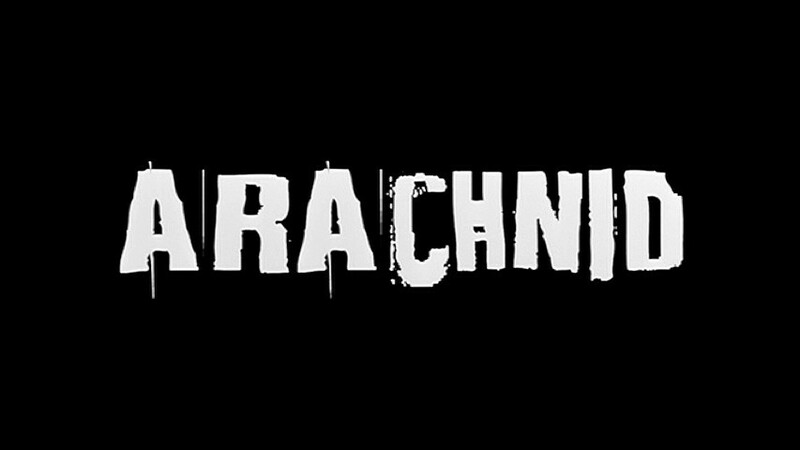 The one in Arachnid is an outlier in a number of respects, but primarily for spending the entire film on a tropical island. An experimental jet crashes into an invisible space ship, unleashing a giant alien spider on a remote island. We never get any explanation, but it seems likely that the vessel was collecting specimens from several planets. At least that would be a nice parallel, as there’s an entomologist making liberal use of specimen jars in the humanitarian rescue party sent to the island. Seems the locals have been having fatal reactions to spider venom, and the World Health Organization wants answers. 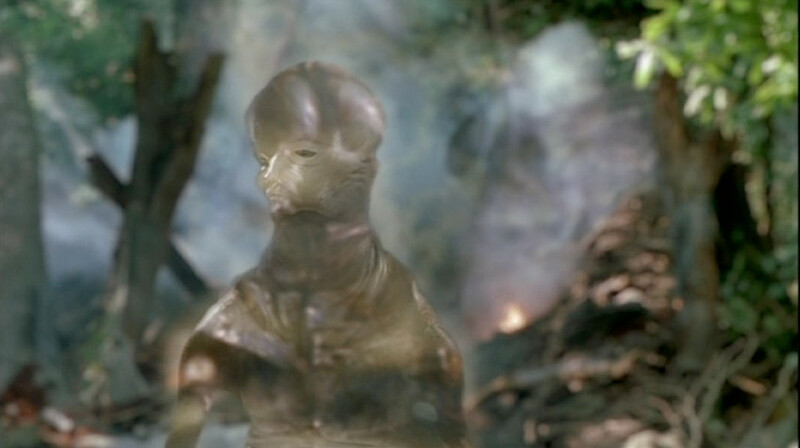 This is the alien, sort of. Much like the spaceship it’s not entirely visible. 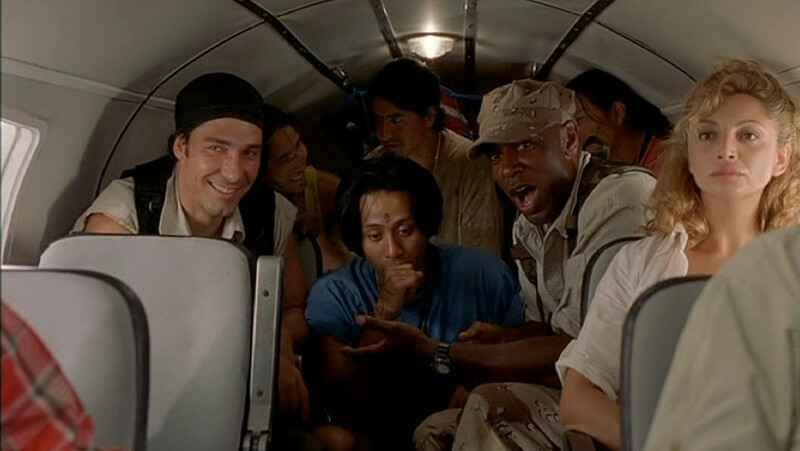 So two doctors and a bug specialist cram into a small plane with three security guys, a changing number of guides, and all of their equipment to go take a look-see. The plane crashes, and again we’re provided no explanation. It simply stops working as a result of failure to continue working. Maybe it’s the space wreckage screwing with electronics? Whatever the reason, our heroes are on the wrong side of the island with no transportation. 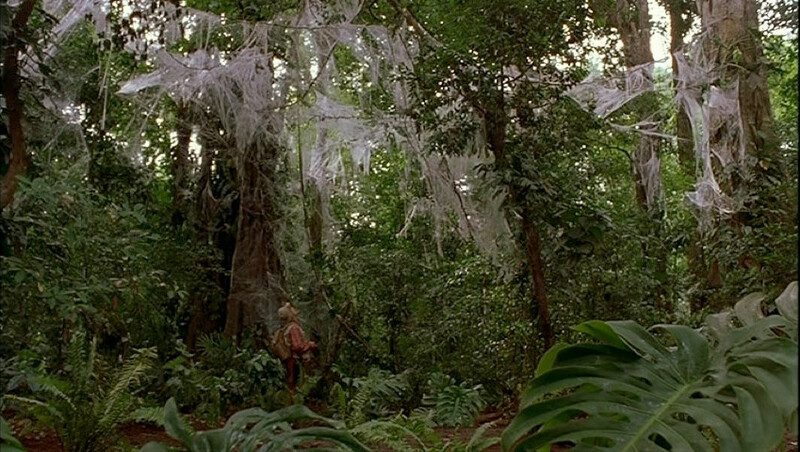 There’s a lot of nonsense about leaving, which is a flagrant impossibility, and then everyone agrees to enter the jungle and the movie gets to the good stuff. Chock full of spider fodder. There’s only one spider, and we do get a few good attack sequences out of it. If this was a video game, the spider would be the final boss who you glimpse along the way but don’t fight for real until the end. The rest of the time, the cast is dealing with its mutant children. The creature is trying to breed, and while it seems bizarrely compatible with all of the local fauna few offspring are viable and none so far seem able to reproduce. So we get burrowing ticks, spider snakes, and what might be a giant centipede to whittle down the group before big alien mama comes in to mop up. How the giant spider breeds with creatures of all sizes on an alien world is a mystery of science. You may as well ask how it’s taken 10 months for any of this to effect the people living on the island. How do we know how long the spider’s been there? Well, it turns out that the expedition’s pilot is the sister of the jet pilot that ran into the spaceship. She’s spent the last 10 months looking for him. You might think that the folks who lost an experimental jet with pilot might have gone looking around the point of last contact, but the writers clearly did not. This is a film that asks you to pour cement on your disbelief’s feet and toss it in a lake. The entomologist should recognize that this means trouble. Unfortunately, even if you do get around the entire lack of sense-making, there’s not much of a reward. 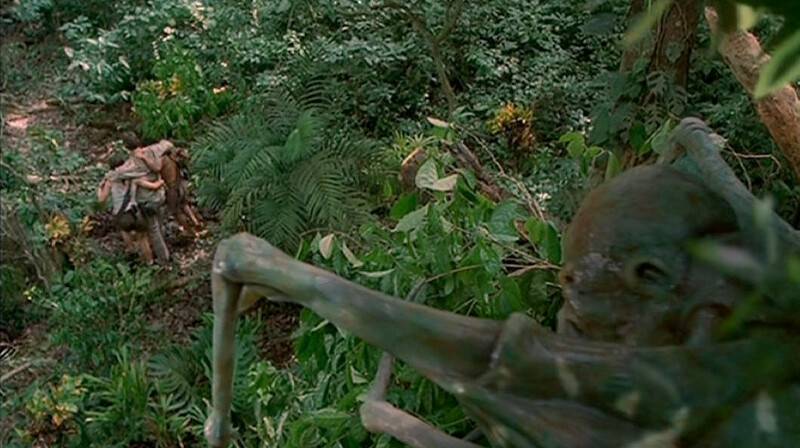 A few scenes are conceptually horrifying, but the budget effects and uninspired direction undersell the tension. Leads Chris Potter and Alex Reid may hit their marks, but with no motivation and tepid dialog their romance is dead on arrival. About all this has going for it is that it’s a C- in a genre rife with failing grades. When we finally see it, the alien spider is pretty neat. 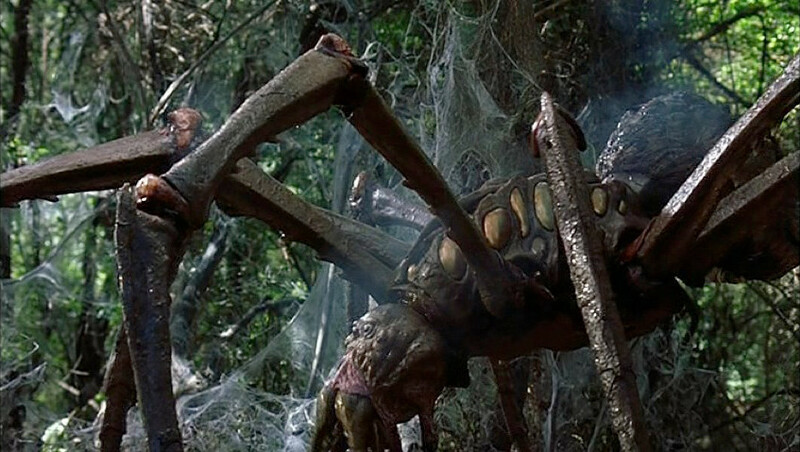 There are much worse giant spider movies, but most of them are more entertaining. (Not Creepies . Dear gods, not that one.) This is just so bland that there’s plenty of time to be turned off by its idiocy. The film livens up once the spider finally attacks, but by then it’s too late to recapture good will. 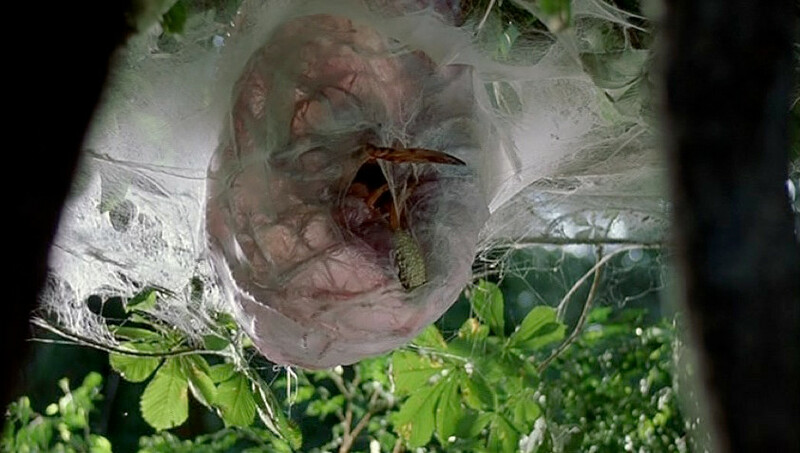 Maybe more spiders would have been better than the half-baked hybrids. At least action could sweep the audience past all the plot holes.